After spending some time at Waldameer, we decided to spend a little time on the beaches at Pennsylvania's seashore, Presque Isle State Park. 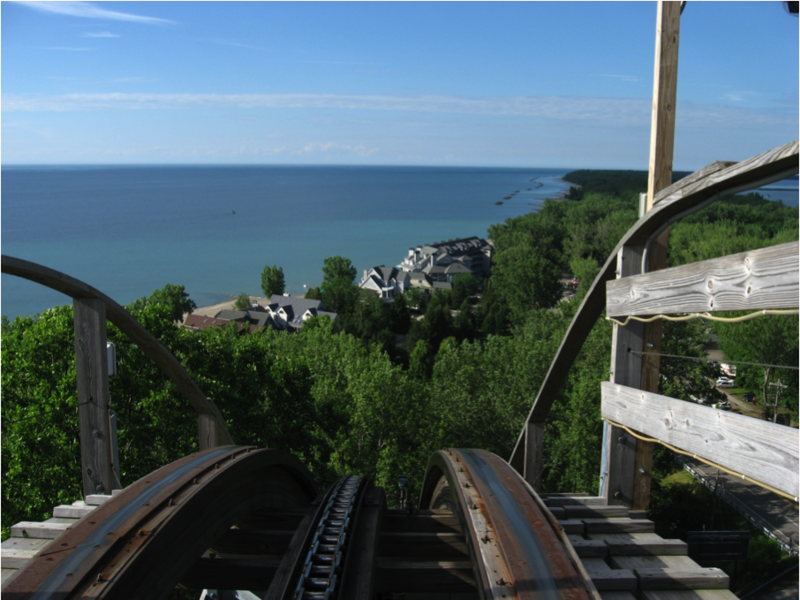 Here is a view of the peninsula from Waldameer's premier roller coaster, Ravine Flyer II, to give you an idea of Presque Isle State Park's beautiful peninsula into Lake Erie. That day was so clear that you could see Ontario, Canada out in the distance. Here you can see how the park looked this past winter, along with the free Tom Ridge Education Center that has some cool exhibits about the park along with a cool observation tower. We spent a little time dipping our feet in and trying to fly a kite before a short storm cell came in. People were hanging out, playing in the sand, grilling, and more. We ducked into our car and appreciated the beauty of the storm. In one of the Peninsula's small lakes, a series of house boats is set up. I would really like to stay in one of these sometime. The storm cell quickly moved through, leaving us with some cool views of the storm line. This view is looking out over the bay. Earlier in the day before the storm came in and some boaters were out, we spotted a fisherman bring in a very large bass. Presque Isle Bay is a very popular boating and fishing spot. The views of Erie and Presque Isle from the bay are stunning. Here is the same view from over Valentine's Day...What a difference a season makes! The view from the other side, with the sun peeking out. It is stunning to look at nature like this. The view of the Perry Monument from across the bay. I am not certain what I was thinking when I took this shot, not balancing it at all. The Perry monument memorializes Oliver Hazard Perry, a naval war hero in the War of 1812, one of the most ridiculous wars in the history of the country. He was able to protect Lake Erie and the entire British Squadron surrendered, opening up the possibility for America to invade and take control of Canada. That option was not exercised and this was kept as a mission for defense. This body of water is named "Misery Bay" because the navy men had contracted diseases like smallpox and were kept in isolation in this spot and subsequently died and were buried at the peninsula. A rare heavy and sad chapter about this beautiful place that also teaches us how stupid war is. The War of 1812 is easily one of the most pointless wars in the history of our nation. Presque Isle is such an idyllic place, along with the rest of the Erie region. Here you can see a low wake buoy for boaters and a swan. Back over to the houseboats. You don't think of houseboats being located in Pennsylvania. I would love to see them build some more of these and rent them out as cottages. Presque Isle is Pennsylvania's most visited state park, yet it boasts no accommodations. It would be very difficult to build or open up a campground on the peninsula because it is narrow in pretty much every spot, but houseboats could work out as accomodations. The peninsula boasts two beautiful Lake Erie lighthouses. A third small one is located on the bay side of the peninsula. This is the Erie Harbor North Pier Light, also known as the Presque Isle North Pier Light. It is operated by the US Coast Guard and was forged in France and assembled to help ships navigate the narrow waters that enter into Presque Isle Bay. Now back to Beach 10, our favorite beach on the peninsula. A beautiful rainbow formed with the passing storm. Vanishing rainbow. One of the coolest things about stepping back out on the sand after a quick downpour is how the sand almost looks reset. All of the footprints and everything get flattened back out. Brit's fresh footprints in the sand. Every visit to Presque Isle is vastly different. There is such an array of activities to do, from sightseeing to hiking, bicycling, boating, kayaking, fishing, picnicking, swimming, sunbathing, and more. Presque Isle State Park is a nature lover's paradise. We go several times a year and end up doing something completely different each time. Our last stop is at the Presque Isle Light that dates back to 1872. This beautiful lighthouse is at the northernmost point of the peninsula. Here is the view from the shore at the lighthouse. Such a vivid and beautiful view. The sun peeking through, with sunset not too far off. 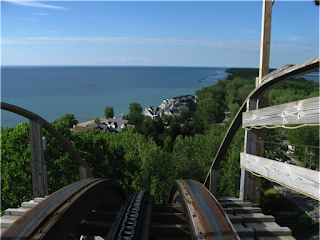 Our next stop was to get some more riding time in at Waldameer Park. Be sure to check out this area for it is an excellent place for a relaxing getaway.